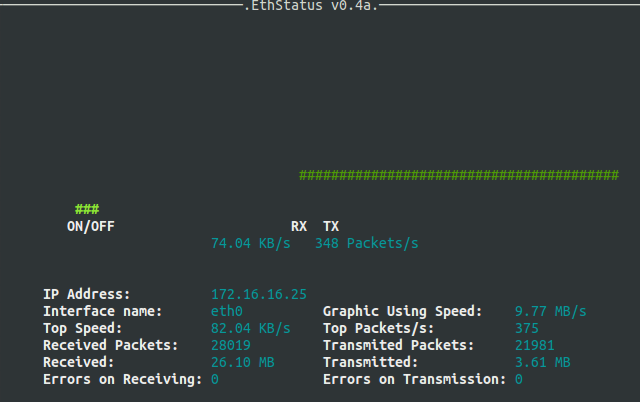 Ethstatus is a console based monitoring utility for displaying statistical data of the ethernet interface on a quantity basis. Specify the ethernet interface which shall be monitored. Default is ‘eth0’. and ‘mono’ (useful for black-and-white monitors). Set the maximum network speed in bits per second. ethstatus knows about the kilo (k), mega (m) and giga (g) modifiers. So you can specify the speed as e.g. 64k or 100m or 1g. Set the maximum network speed. Possible values are ’10’ (=10 Mbps), ´100′ (=100 Mbps), ’64’ (=64 kbps), ‘128’ (=128 kbps), 256 (=256 kbps), ´768′ (=768 kbps) or ‘1540’ (=1540 kbps). This option is provided for backward compatibility to prior versions of ethstatus. Please use the -S parameter instead. A cross-browser script that adds a button to download YouTube videos as MP4 and FLV files. Script downloads the videos directly from YouTube. No need to copy-paste YouTube URL to some third-party websites or anything. Ability to download videos form YouTube in 720p(HD), 1080p(Full HD) and Normal 360p and 480p MP4 file formats (if available). It integrates nicely with the YouTube interface. SPT is a great new tool you can use for Pentests or just showing people how easy it is to be phished. I’ve setup SPT on a small VM and have used it to show friends and family the emails that it sends, and it really highlights to them how easy the bad guys can try to get you.